The Naranag valley is noted for its scenic meadows Naranag is 40 Kms Approx from srinagar. The village is a base camp for trekkers to the Mount Haramukh, the Gangabal Lake and SATSAR (The Seven Lakes). It is also a base for the trekkers to Gadsar Lake, the Vishansar Lake, Mansar Lake, Bishansar Lake, Ramsar Lake and the Krishansar Lake, though it takes 5 to 7 days of trekking. There are also many other peaks and alpine meadows around the Naranag Valley. In the winters, Naranag receives heavy snowfall, during which skiing is practiced. At the base are the remains of ancient temples built with large granite blocks. The monument looks fascinating with huge rock blocks resting over one another. In the nearby area is a small village. The temple complex is believed to be ancient monuments dedicated to the deity Shiva. Except granite blocks there is no sign of building material, as were used in the latter years. Read more about Naranag Tourist Information and tour guide. The Naranag temple is the main attraction for the tourists. It is one of the important archaeological sites of the country. The site consists of a cluster of temples facing each other at a distance of about 200 meters. Historians say that the temple is dedicated to Lord Shiva by the 8th century ruler Lalithdatiya muktadiya. It is believed that the king Awantivarman paid a visit and donated a pedestal for bathing at Bhutsher. Its architecture reveals the art of the 8th century. The government has only constructed walls to protect it from encroachments and nothing else has been done. It is now left in ruins of which only faint traces have survived. 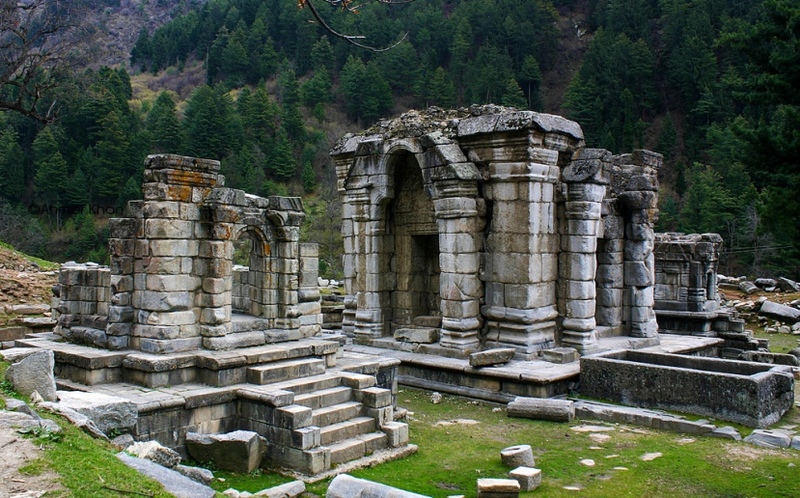 This temple has the typical Aryan structure as was present in Aryan Kashmir..
Gangabal Lake is one of the bigest lake in gangbal. The Gangbal Lake or Bowl of Elixir (Amrit) Gangbal Lake is situated at the foothills of Mount Haramukh (the highest mountain peak in the vicinity of Kashmir valley)in Ganderbal district, north of Srinagar city in the state of Jammu and Kashmir, India. It is an alpine high altitude oligotrophic lake home to many species of fish, including the brown trout and Sinor Cat fish. The lake has a maximum length of two and a half kilometres and maximum width of one kilometre. It is fed by precipitation, glaciers and springs. The lake water outflows to a nearby Nundkol Lake and then via Wangath nallah to Sind River. Satsar ( The Seven Lakes) the Vishansar Lake, Mansar Lake, Bishansar Lake, Ramsar Lake and the Krishansar Lake, though it takes 5 to 7 days of trekking. Perched at a height of 3710 m above sea level, Vishansar Lake lies around 35 km from Shitkadi, Sonmarg. With a length of a kilometre and a width of 0.6 km, this charming lake is among the visitor’s delight in Sonmarg. The spectacular surrounding with snow covered mountains and meadows around with alpine flowers make it a haven for trekkers and adventure lovers. Besides, the lake is home to different species of fishes. Gangabal lake, also known as Harmuk Ganga at a height of 3570 m above sea level is a popular attraction in Sonamarg. It is considered sacred place by Hindus. Also a popular spot for rainbow trout fishing, the lake can be reached from Sonamarg via Krishnasar and Vishansar, after an enjoyable trek through enchanting scenery. The Naranag region is renowned for trekking and hiking trails. The snow clad peaks in the Himalaya and the undulated hilly mountainous regions are perfectly suitable for all types of trekking expeditions. Naranag is the base camp for many trekking expeditions. The major treks passing through various mountain lakes such as Gangabal, Vishansar, Gadsar, Satsar and Kishansar has its base at Sonamarg. The trekking routes offer all types of challenges, from mild to most hard. The pleasant climate with mild summer and cold winter make this place an ideal location for trekkers to explore the natural beauty and challenging treks. Naranag experiences cool climatic conditions to snow covered chilly periods but the best season to visit Naranag is from May to October. (November to April) are chilly with temperature goes down to subzero levels. Snow bound landscapes are the typical views in winters and snowfall is common. (May to October) are pleasant with cool atmosphere and climate. Average temperature is around 20°C. Summers is ideal for sightseeing, adventures and pilgrimage. Snow can be found on high altitudes.